At The Cottages, we welcome a variety of therapies and activities to help our residents live a full and comfortable life. At our Chandler Creek and Clear Lake locations, therapy dogs are regularly welcomed into our facilities. Many people are aware of the use of service dogs, but therapy dogs are trained differently than service or assistance dogs. According to Assistance Dogs of America, service/assistance dogs perform an actual service to the client while therapy dogs have primarily an emotional/cognitive benefit to the client. There are a variety of service and therapy dogs available to help people with different levels of disability. These include: dogs to aid clients who are blind, have epilepsy, mood disorders, diabetes and mobility issues such as quad or paraplegia. Service dog training is tailored to the needs of the client. Some service dogs are specifically trained to assist those living with dementia. Service/assistance dogs are allowed to go anywhere their owner goes according to the Americans with Disabilities Act. An Israeli social worker was the first to come up with the idea of a guide dog specifically for those suffering dementia. They developed a training program for an Alzheimer’s Aid Dog. Later, a team in Scotland created a project to further explore the benefits unique to a guide dog for those living with dementia. That research is still in ongoing but families feel they are seeing improvements in their loved ones’ lives as a result of their four-legged companions. Opening doors, retrieving phones, activating switches, aiding in dressing, carrying items, picking up dropped items, bring meds to the individual in a bite proof pouch, reminding the where their clothes are, waking them up in the morning, pulling a wheelchair, assisting client up from a fall, help climbing stairs, providing balance for walking are just some of the direct benefits a service/assistance dog can provide to the individual living with dementia. One of the main tasks of a dementia service dog is to get the owner home when the command is given or to remain with the owner and bark for help if the owner refuses to go home. The dog also has a GPS tracker on so it is easy for the family to locate the pair should they ever become lost. The dog is also trained to not allow the owner to leave the house unaccompanied, which is invaluable if the owner spends time at home alone. While therapy dogs are also beneficial they do not have the same rights as service dogs when it comes to entering businesses with their owners. 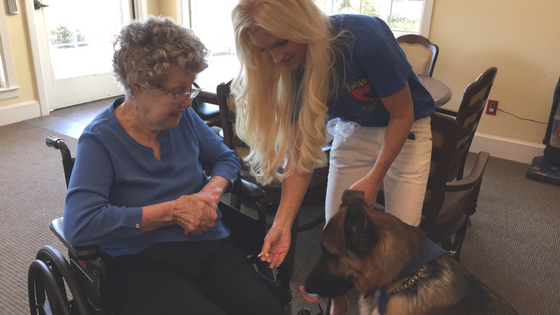 Therapy dogs are beneficial to dementia residents because it is important for the tactile and cognitive stimulation that petting a dog brings. The therapy dog can bring happy, familiar memories and even smiles to a resident who is reminded of pets they once had. The dogs can be an extreme source of comfort, often calming an agitated resident. Often facilities report an improvement in nutrition among some of their residents after the arrival of a facility dog, possibly due to the elevated mood the animal brings to the residents. The facility therapy dog brings the residents together to care for the creature and can be significant in decreasing behavior issues. 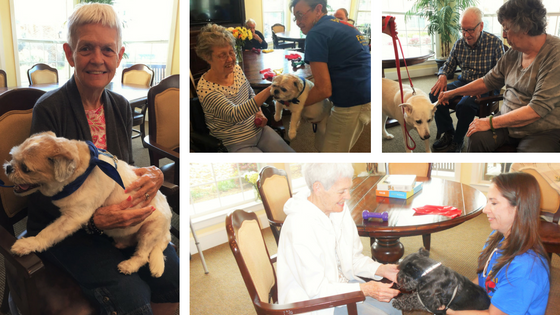 At The Cottages, we hope to continue to expand the therapy dog visits into each of our facilities so all of our residents can benefit from the love and companionship of dogs. For more information on service and therapy dogs, visit www.assistancedogsinternational.org; www.dogwish.org; or www.therapydogs.com.